This was the menu from Heartland Range & Shooter's Saloon in Sparta IL at the World Shooting and Recreation Center, where I was the GM in 2006. I helped to design and come up with some of the menu items. I have removed any phone numbers as they are no longer operational so if I missed any, they are not for Heartland Range or me. Also logos have been removed, as they did not copy to this blog posting. The Heartland Range proudly serves “Natural” Steaks and Prime Rib from select Midwest Ranches. Natural Beef Cattle are never introduced to steroids or growth hormones and they are weaned off antibiotics for over 100 days. “Natural” Beef Cattle are corn-fed for 220 days, which is over 100 days more than average. This extra corn diet gives “Natural” Steaks a buttery texture and rich flavor. We specially season all “Natural” Steaks and grill them to order. All Steaks and Prime Rib are served with a choice of two sides. 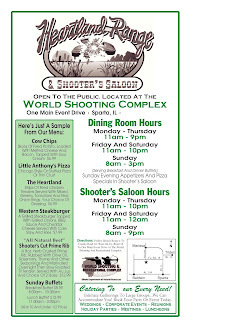 Lil’ Shooter’s meals served with Fries and a Soft Drink, unless otherwise noted. A tasty 4oz Rib-Eye Steak seasoned and grilled, served on top of Grilled Texas Toast with Smashed Potatoes and Brown Gravy. Served with a side of Roasted Veggies. A meaty grilled Chicken Breast that has been marinated in Tequila & Lime along with our own special blend of herbs and seasonings. Served with Roasted Veggies and Texas Toast. A juicy grilled ¼ lb Burger served with cheese, fries, & slaw. Our Daily Soup combined with a freshly made House Salad and topped with your choice of any one of our delicious Salad Dressings served with Warm Garlic Bread. Make it all you can eat for just $2.00 more! Free Snacks in the Saloon with the purchase of a beverage, $5.00 12” Rising Crust Pizzas, and $1.00 Domestic Drafts. $3.00 Nacho Supreme, $3.99 Monster Taco Salad. ½ Price Glass of House Wine, & $1.75 Corona and Heineken Bottles. All ladies receive a free desert with the purchase of an entrée. $1.50 Pulled Pork Sandwich, & $4.99 1/3 Slab of Ribs. $2.00 Mike’s Hard Beverages, Smirnoff Malt Beverages, & Bacardi Malt Beverages. $1.50 Mixed Well Drinks, $1.00 off all other Mixed Drinks. Along with some good ol’ country hospitality! $1.00 Domestic Bottles of Beer, & $1.50 Well Brand Shots. to remind you to drink responsibly. Beverages – Assortment of Pepsi Products, Gatorade, Water, and other beverages with assorted prices. Gift Shop available upon request at Heartland Range and Shooter's Saloon host station, just ask and someone will be glad to let you in to shop and browse. Join us for daily drink and meal specials! We will Deliver to area Schools and Businesses on weekdays. 1 Minimum Order amount will apply. 2 Delivery Charge may apply. 3 Orders must be placed a minimum of two hours before desired. Call Skip / Tuesday – Friday for more information on Catering, Banquets, or Parties.